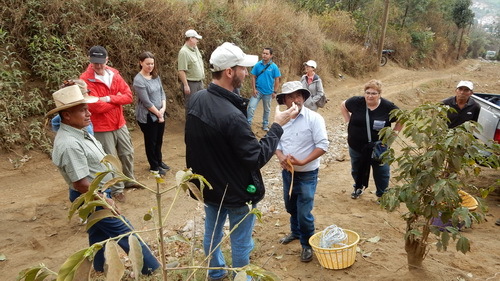 We spent the morning of our third day meeting a group of smallholder coffee farmers. We met at the farm of one of them, Basilio Minas. These were farmers who had been through the standard two-year-long training program offered by TechnoServe. For the program to be effective, the farmers need to see the methods employed for that long in a demonstration plot. By the end of two years, it has become clear that production and quality are really up, and most of the trainees buy in. Shorter periods are less effective, even though the technical material can be covered in a shorter time. Eduardo introduced us to one another, and then turned us over to the farmers to get an education. They started by showing us a couple of problems. 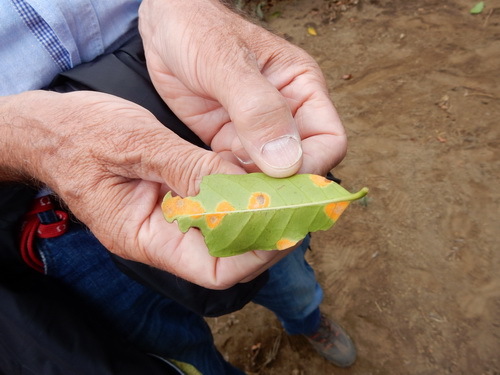 First, Guatemalan coffee farms have been heavily affected by leaf rust. In the past, many coffee farmers here were basically picking coffee from largely untended coffee plants. Those don’t produce much, and are especially susceptible to leaf rust, as well. 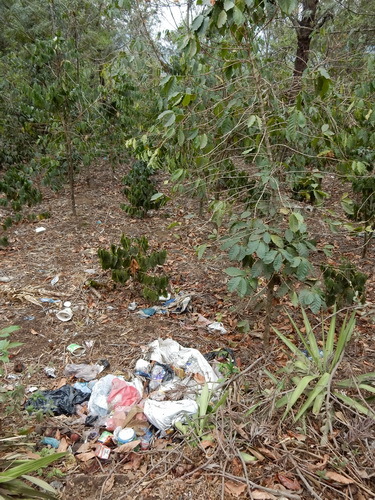 Trash is also a problem in Guatemala in general, and is often another factor in poor coffee productivity. AFter thus showing us how not to do it, our farmers let us play a bit in Basilio’s well-tended farm. 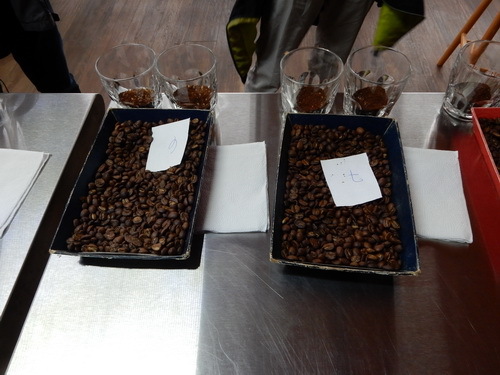 First, they divided us into three groups, and ran a coffee-picking competition among the groups. 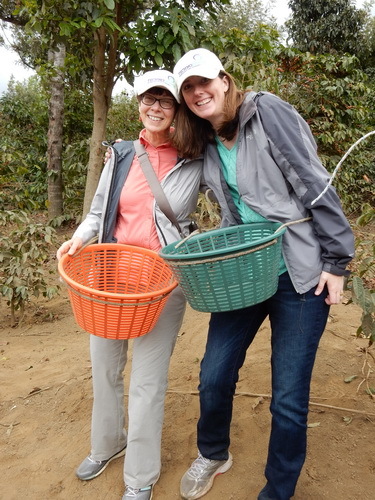 Here are Jeanne and Tammy outfitted for picking coffee cherries. 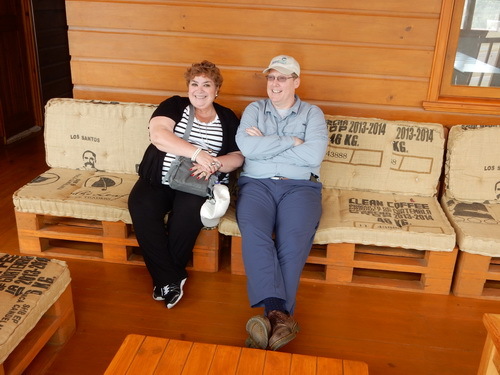 This contest was fun, and gave us a chance to get to know the coffee plants much more intimately than on any other visits I’ve made to coffee farms. I now have a greater appreciation for the effort involved, but also a little insight into proper technique. Our three groups produced rather different results. 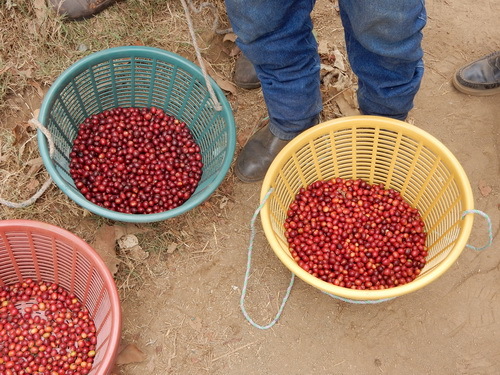 One group (yellow basket) picked the most coffee, but a different group (aqua basket) had higher average quality. You can actually see the difference by comparing the colors in this photo. (I’d rather not say which of the three baskets my group picked.) The farmers correctly predicted who would do the best. It seems that women are consistently better at this task than men. 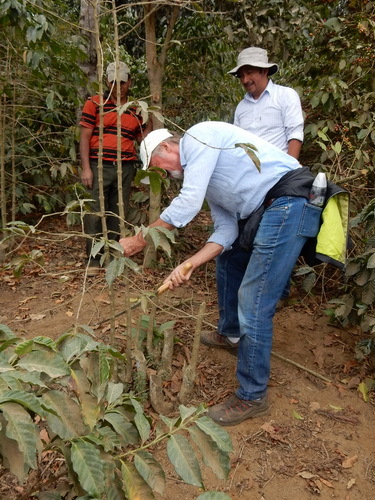 Next, the farmers taught us a bit about pruning coffee trees. There are several different kinds of pruning, and we learned “stumping”, in which only the stump of the tree is left. This encourages formation of new branches and can revive productivity (after a delay of two years). Here’s Hans Rueedi showing how it’s done. Here’s the whole crew. We enjoyed meeting them, and appreciated the hands-on experience they provided for us. Posted 1 year, 11 months ago at 3:25 am. 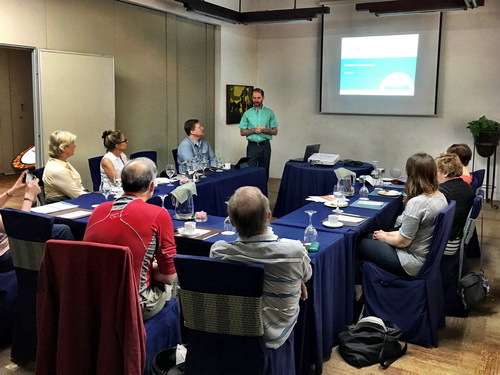 Our first full day began with a breakfast talk by Eduardo Rusty, TechnoServe’s country director in Guatemala. He gave us an overview of TechnoServe’s history in the country, and of the sorts of projects they undertake here. The two main areas are agriculture and entrepreneurship. We would see multiple examples of each during our visit here. 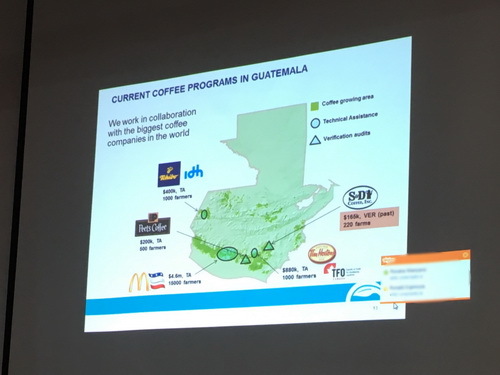 TechnoServe does a lot of work with coffee here, partly because this is a way of improving the lot of a large number of smallholder farmers. 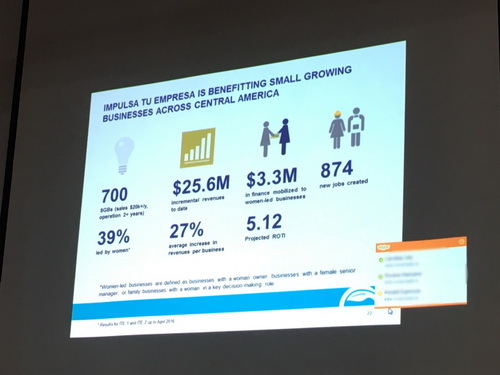 Meanwhile, the “Impulsa tu Impresa” program focusses on helping entrepreneurs develop their Small Growing Businesses. Eduardo then introduced us to the first TechnoServe client whose work we would see, Giuliana Gobbato. 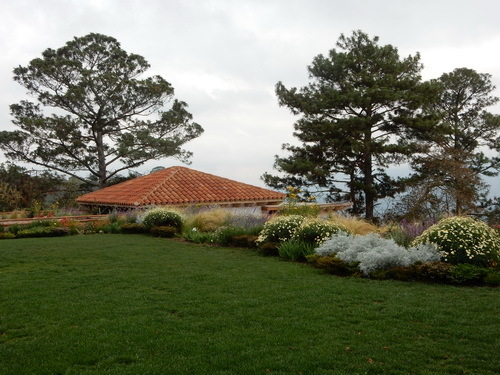 Giuliana is the founder of a rather special landscaping company called Green Gardens. 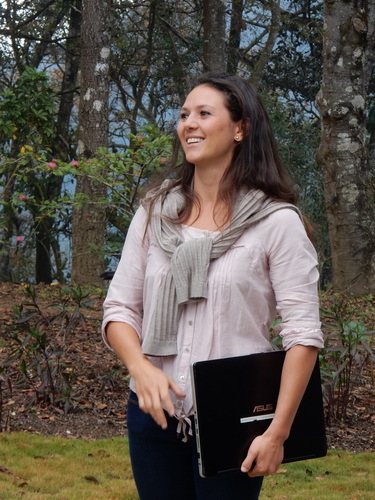 Born in Guatemala, she earned a degree with a double major in biology and sustainable agronomy from the University of California, Santa Cruz. She returned to Guatemala with a goal. The goal is not gardening, though that’s how she spends her time and it’s probably what most of her clients think they’re buying. Her real goal, though, is to help people have a more positive impact on the environment. To show us what she means, she gave us a tour of the gardens she has designed and developed at a client’s beautiful country estate. The decorative gardens were all quite beautiful, too. 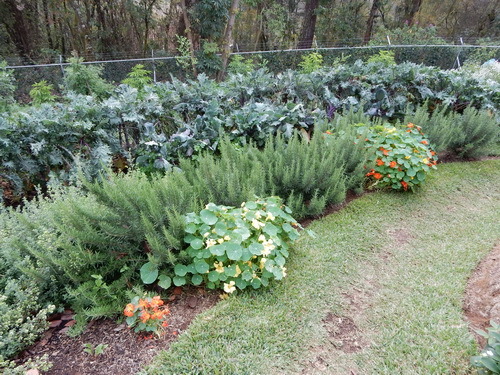 But the edible gardens were definitely the main course. 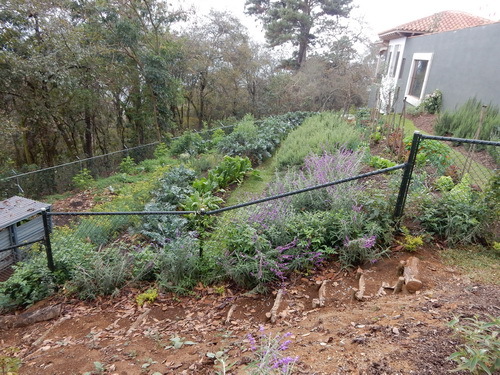 She showed us a number of features here that benefit from an in-depth knowledge of garden ecology. Here, for example, she has taken advantage of different growth patterns of plants to do a sort of “double layering”, in which plants whose growth is primarily below ground occupy the same space as other plants that grow primarily above ground. 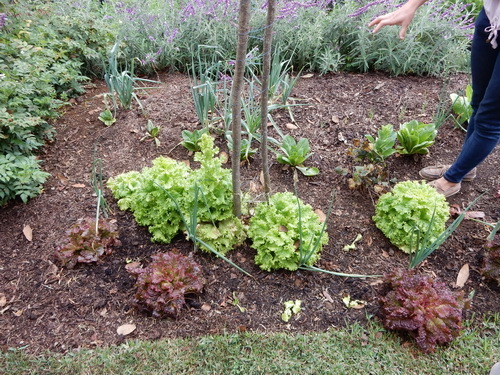 Here’s an example in which rows of edible plants are interleaved with rows of plants deliberately placed here to enrich the soil. 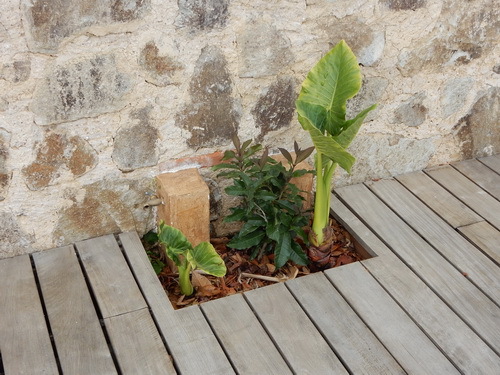 And here’s an example in which plants are placed together to help one another. 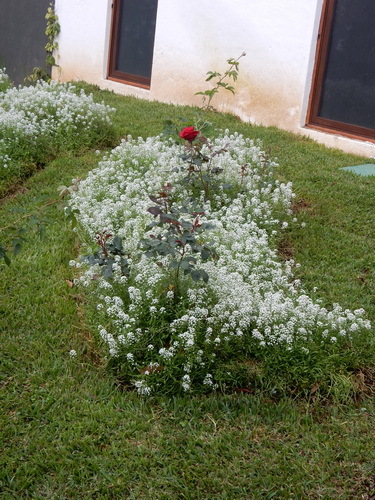 The Alyssum actually repels aphids that otherwise feed on the roses. Giuliana is clearly very good at what she does, but she began her business with a lot of content-area knowledge and very little understanding of how to run a business, from keeping the books to marketing, to accessing needed inputs. She says she has benefitted greatly from TechnoServe’s educational process and consulting. She’s also benefitted greatly from the community of entrepreneurship clients that TechnoServe has assembled. They form a mutual-help network that generates ideas, cooperative projects, and good friendships. I’ll include one more photo of Giuliana’s work, but this one is just here because I really like it. That brought us around to lunch time. We always eat well. 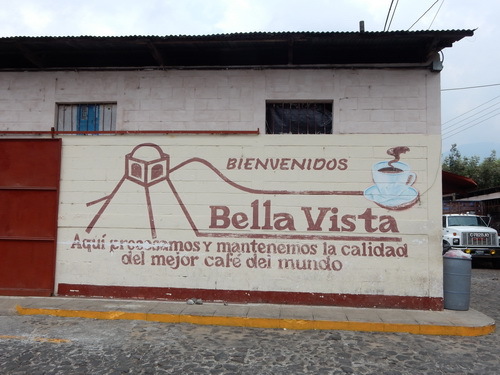 In the afternoon, we visited the Bella Vista Coffee Farm. 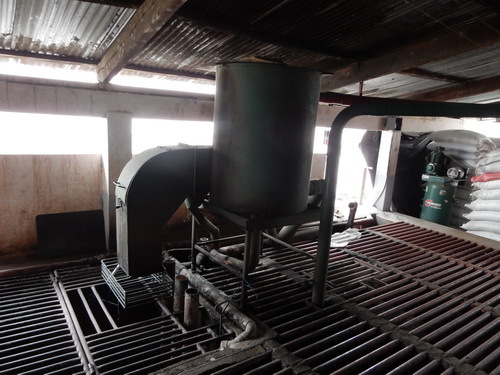 This is actually both a farm, where coffee is grown, and a coffee processing plant, where coffee from the farm itself, but also from smallholder farmers in the area, is wet-processed. 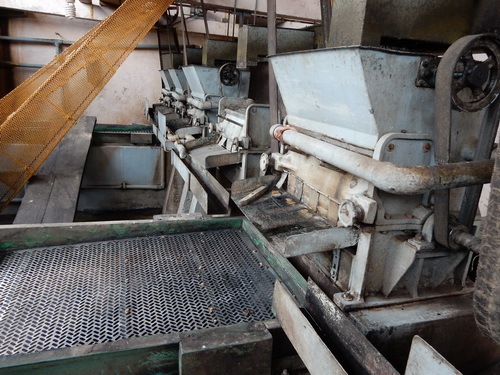 I’m a serious coffee hobbyist (home roaster, certified barista), and so I’ve seen a number of coffee farms, big and small, as well as both wet and dry processing plants. I have to say, though, that I enjoyed this tour more than any I’ve had in the past. 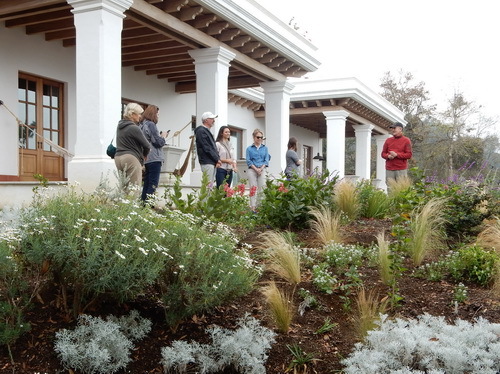 Our tour guide was Luis Marroquin, who has worked at Bella Vista for many years. He was a manual laborer here until age began to limit his ability to carry around 150lb bags of coffee and other things (more of this later), and now he serves as a very able tour guide. 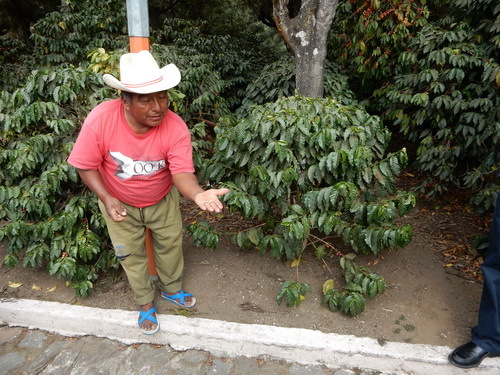 He started by showing us coffee cherries (the fruit) that contains the beans (seeds) and their structure. Next, he showed us coffee plants, and described how they graft higher-quality arabica plants onto lower-quality but hardier robusta plants. This not only results in higher-quality coffee that is more resistant to insects and other insults, but it also results in plants whose height can be controlled by the farmers. That makes picking easier. Here’s a somewhat unruly example, also illustrating a wide range of ripening that’s typical of the end of the growing season. 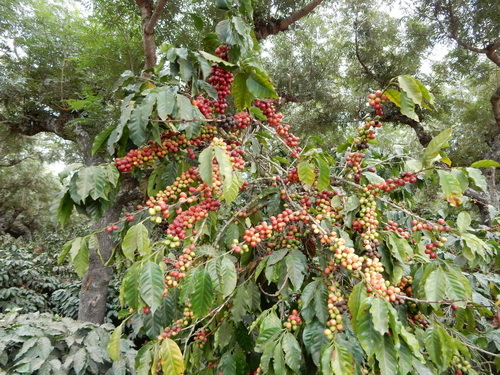 Those coffee cherries at the very top are at the perfect stage for picking. Luis showed us around the entire coffee processing facility, explaining how the coffee moves around and all the machines and processing steps involved. I’m going to just show a few photos, with little explanation, as my purpose here is to convey to you the kind of touring we do, and not to give the tour. Here’s the final stage. 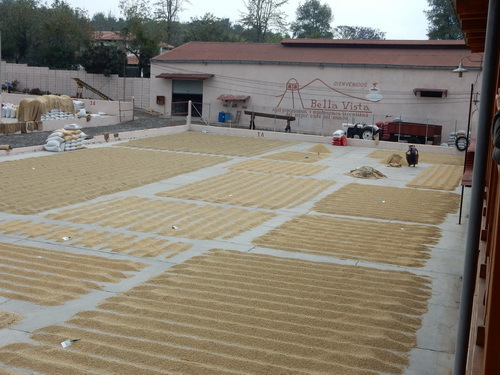 This coffee is in batches by source, drying after processing, and available for tasting and sale. There are a lot of heavy bags around, often weighing in at more than 150 pounds. Fortunately TechnoServe’s Andrea Stepanski was available to help with the work (she makes it look easy). In fairness, though, we saw factory workers carrying them two at a time, and theirs were definitely at the heavy end of the scale. Not everyone in our party was so energetic. 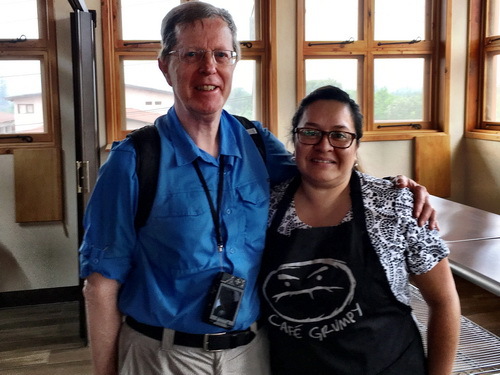 Here are Carla Lopez, of TechnoServe Guatemala, and John Keightly, TechnoServe Vice President who manages the Global Advisory Council and these trips. 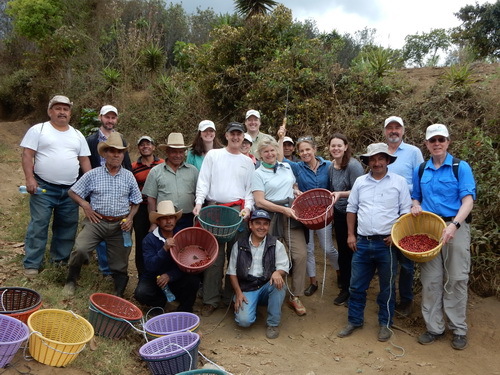 At the end of our visit to Bella Vista, we were treated to a coffee cupping. Cupping is a standard, simple procedure whereby coffee tasters prepare and taste coffee samples in order to evaluate and perhaps compare them. This cuppiing was managed by Bella Vista’s professional cupper, Dulce (“sweet”) Barrera. She set up a cupping that allowed us to compare 9 different batches currently available for sale. I’m pleased to report that, though I’m no supertaster, I picked the same first and second-best coffees that she did. Here I am with Dulce. Posted 2 years ago at 3:01 am. Alice and I (Rudy) are members of the Global Advisory Council (GAC) of TechnoServe. TechnoServe is one of the international NGOs on our “Strategic List”, and their GAC consists of a group of their especially involved donors. Each year, the members of this group have an opportunity to travel together to one of the countries in which TechnoServe works, and to view the work first-hand. We’ve previously traveled with this group to Chile and Mozambique, and in March, 2017 the group visited Guatemala. Because Alice was still recovering from knee-replacement surgery, she didn’t go on this trip, and I took her sister, Jeanne Haster, who lived in Guatemala for four years in the late 1970s and early 1980s. This was her first visit to Guatemala since that time. Jeanne is Executive Director of JVC Northwest. 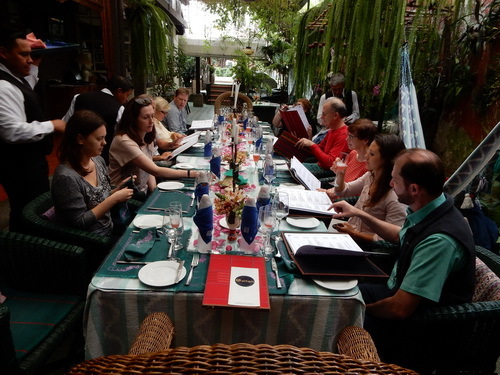 When we arrived in Guatemala City, we were met by a TechnoServe driver who took us to Antigua, where the group was gathering for the tour. On the way there, we learned that all the entrances to Antigua were closed because of a Holy Week procession and other festivities in the streets. That seemed like bad news, as we were imagining sitting in the car for four hours waiting for the procession to end. 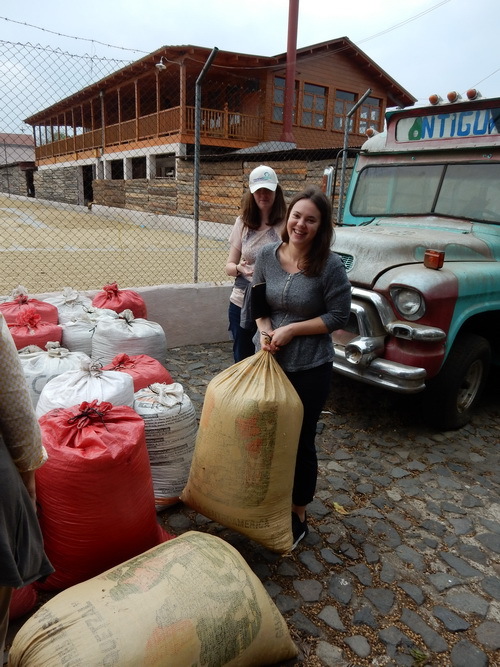 But our driver turned that into good news, as we parked the car and walked into Antigua, luggage and all. In the process, we walked right past the procession and through the gathered crowds. What a delightful experience! 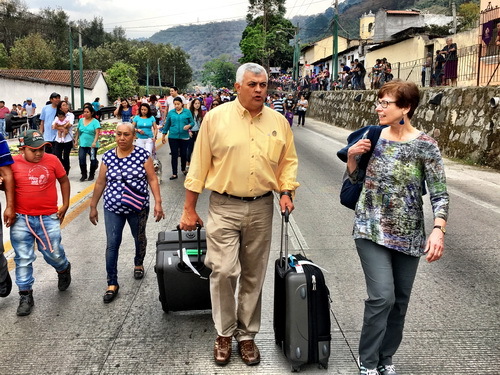 Here are Jeanne and our driver, Luis Fernando Munoz, walking through the procession crowd to our hotel. I tried repeatedly to wrest our luggage away from Fernando, but he wouldn’t give it up. 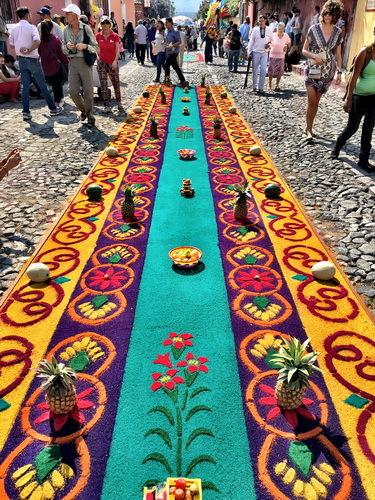 A dominant feature of the celebration were alfombras, beautiful carpets made of brightly-colored sawdust. 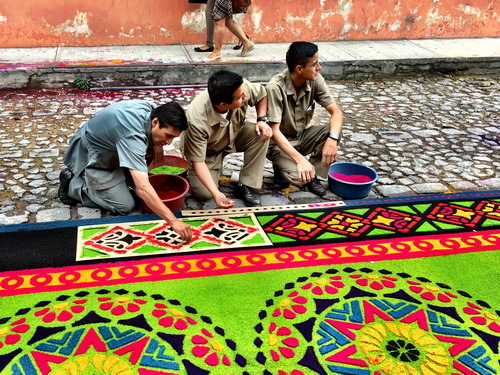 Here’s how the alfombras are made. 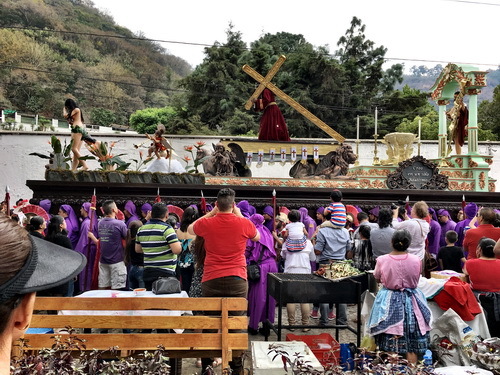 The other special feature of these processions are andas which are like parade floats, but they contain appropriate religious statuary, and they’re carried aloft by large numbers of people. A really big anda might be borne by hundreds of people. If you look carefully through the crowd here, you can see the folks — all dressed in purple — who are carrying this anda. Apparently, brightly colored sawdust has additional uses, as we discovered in our hotel, the Casa Santo Domingo in Antigua. 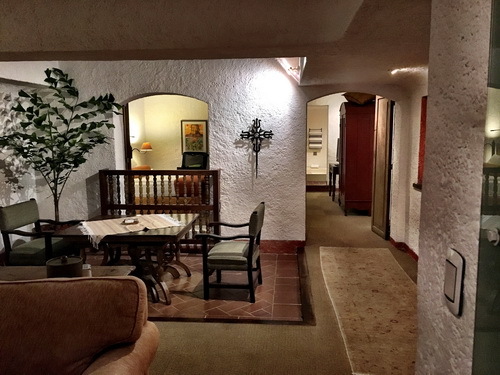 The rooms in this hotel were remarkable, and I was especially lucky. Our dinner was excellent, as well. 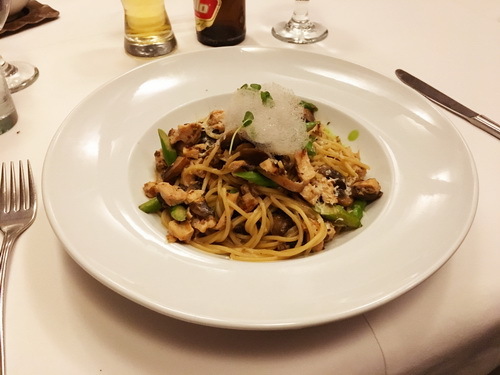 The foam on top of mine was made of mushrooms. 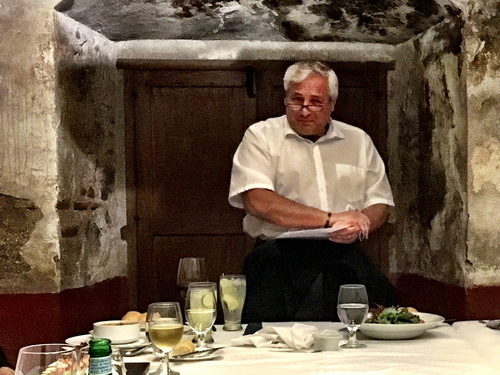 And finally, we were welcomed by our after-dinner speaker, Lionel Lopez. He is currently Vice Minister of Finance for Guatemala, and he’s also a former TechnoServe Country Director. He gave us a very interesting overview of the challenges faced by the relatively new government. In particular, he summarized Guatemala’s economic situation and the plans and general approach being taken by his department. He’s a very engaging speaker, and he gave us a good deal of context that was useful in our visits to TechnoServe clients over the next few days. Posted 2 years, 1 month ago at 1:22 am. 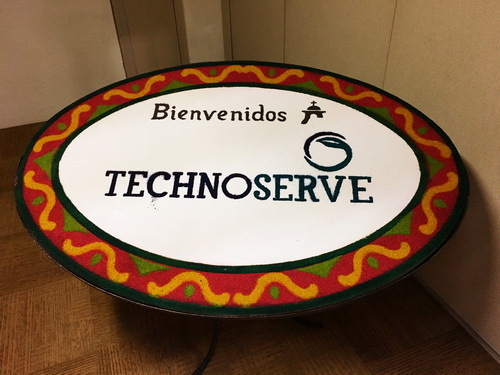 TechnoServe is one of our favorite international NGOs, and we’ve just started our second special project with them. This project is part of their entrepreneurship program, and concerns “Smart Dukas” in Nairobi, Kenya. Dukas are “Mom and Pop” consumer-goods shops, and in the urban areas of Kenya, they’re responsible for some 80% of consumer-goods sales. Dukas often fail to realize anywhere near their full profit potential, for a variety of reasons. Shopowners often have to close their shops and travel some distance to get new inventory. Dealing individually with suppliers, they fail to achieve economies of scale. They may not know the best ways to present their wares, or to manage a business. These are all areas in which TechnoServe is prepared to provide education, one-on-one consultation, and negotiating power. We’re impressed with the work TechnoServe is planning in this area, and have funded a piece of the work in the latest phase of their “Smart Duka” project. Here’s their proposal: TechnoServe Smart Duka Proposal. Posted 2 years, 2 months ago at 12:00 pm. Five years after our original loan to FINCA Haiti, we’ve received a very nice report on the program. (We’ve previously also reported on this program here. It turns out (much to our surprise) that we provided about 10% of the pool available for microloans in Haiti, and that at any given time, our funds have provided support to some 400 families there. We’re very encouraged to hear about the impact of FINCA’s Haiti program, and our contribution to it. We’ll be leaving the loaned funds there for now, where they will continue to cycle through new microloans and clients. Webmaster Scrambling to Catch Up! Posted 2 years, 3 months ago at 10:44 pm. See Charities We Support for an explanation of our overall program, including strategic investments, special projects, tactical grants, etc. We again funded construction of two houses in Zambia, and a community water point, by Habitat for Humanity. We did no other special projects this year, but are rolling the unused funds over into 2017, when we intend to make three larger-than-usual grants. We also made quite a few small grants, and a few larger ones, to personal-favorite charities that are not necessarily primarily about our core mission. We won’t list those here. Posted 2 years, 3 months ago at 12:00 pm. We funded a special project with Acumen Fund, called Bringing the 4As to Life. This project is intended to provide a reusable framework and standard practices for the use of survey instruments to improve Measurement and Evaluation of Acumen projects. We funded a special project with iDE (International Development Enterprises), called Accelerating Impact in Mozambique. This project is intended to accelerate the introduction of Farm Business Advisors in Mozambique. We funded a special project with TechnoServe, called Monitoring and Evaluation Platform. This project is intended to develop a standardized cellphone-based software platform for doing Measurement and Evaluation in connection with a wide range of TechnoServe projects. Posted 3 years, 3 months ago at 12:00 pm. We funded a special project with the Rocky Mountain Institute, called the Balance of Pack Project, to investigate factors affecting the costs of obtaining and using battery storage for use with renewable energy sources..
Posted 4 years, 3 months ago at 12:00 pm. We’ve been looking for more strategic investments within the U.S., and particularly within our local area, but they seem to be few and far between. This is not to say that there aren’t lots of domestic charities doing good work. But they seem mostly to focus on helping with today’s problems. I usually refer to these as “finger-in-the-dike” efforts. These efforts are certainly necessary, and we do lots of grants of this sort, but they aren’t our main, strategic focus. To fit within the strategic portion of our portfolio, the work has to hold the promise of achieving long-term, sustainable, and scalable change. And, of course, it has to be within one of the areas of focus of our mission statement. So we/re excited to have discovered the Rocky Mountain MicroFinance Institute (RMMFI). As its name suggests, RMMFI makes small loans to budding entrepreneurs. But that turns out not to be the only thing — or even the most important thing — they do. Using a mix of paid and (mostly) volunteer staff, they run a sort of pre-entrepreneurial program to help would-be small-business owners determine whether or not this path is for them, and whether or not they’re ready to take the plunge. Those who are — or become — ready then go through a serious training curriculum, ten at a time. This training lasts 12 weeks, and teaches the aspiring business owners about business opportunity selection. planning, finance, marketing, operations and various other aspects of making a small business successful. In addition to classes, volunteer mentors and coaches provide one-on-one coaching. The incentives built into this program are both interesting and clever. The candidates are — as a matter of policy — urban poor, looking for a leg up. Almost all the candidates come to the program because they’re looking for a loan, and RMMFI will make a loan to any student who successfully completes the program. But the amount of the loan for which the candidate is eligible depends on ratings on a series of three presentations the candidate makes during the program. These presentations demonstrate understanding of important aspects of a successful business, and the final presentation is of the candidate’s business plan. This forces the candidate to be both thoughtful and comprehensive in his or her preparation for the launch of the business. And I find it particularly interesting that many of the candidates who graduate start their businesses without a loan, having learned during the training of other ways to use their available resources to get started without debt. Helped some 1400 individuals consider entrepreneurship. Graduated eight classes, which resulted in the launch or expansion of 65 businesses. Distributed 36 loans, with zero write-offs thus far. I (Rudy) have become somewhat involved with the RMMFI community, observing their student presentations, taking part in critique sessions, and engaging in discussions about the program with those who manage it. I’m pretty impressed. There is substantial evidence that the folks who go through this program are much better prepared to deal with creating and running a successful business as a result. My greatest concern as a possible long-term investor in this program is its scalability. It’s clear that this kind of program won’t scale up by, say, running 10 times as many folks per year through it. The way that it might well scale up is by expanding to other communities, and perhaps eventually by serving as a template for use by other organizations. These are possibilities that are under active consideration by the RMMFI Board. Another concern that comes naturally to mind is the degree to which such an intensive program can be sustained by the involved staff and volunteers. The best answer I can offer is that there’s a remarkable sense of community and enthusiasm associated with this whole affair. I think they may have hit upon a magic formula. Time will tell. Posted 5 years, 2 months ago at 12:07 am.